What a different three years makes! 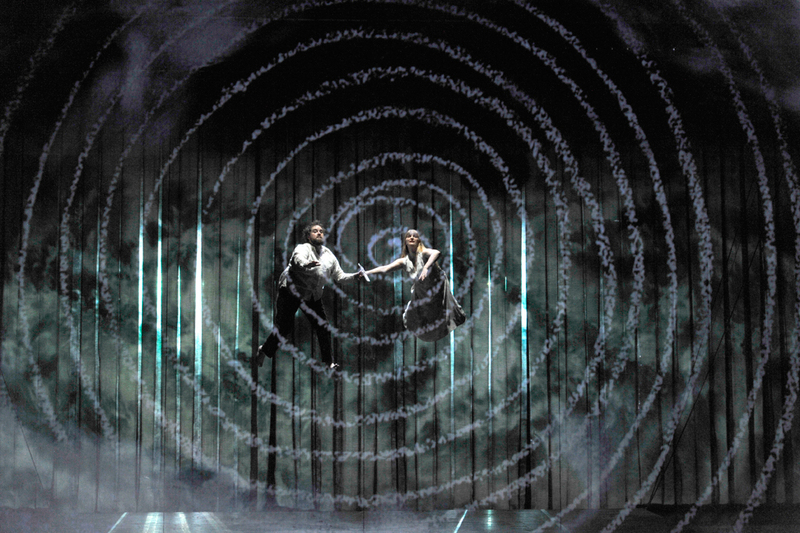 I was rather dismissive of the first run of Simon McBurney’s 2013 new production of The Magic Flute, together with his theatre company Complicite in partnership with Netherlands Opera and Aix-en-Provence. This was the first new ENO production of The Magic Flute for around 25 years, and replaced Nicholas Hytner’s much-loved, if rather traditio nal take. My review of the opening of McBurney’s version included “In contrast to the previous production, this Magic Flute is dark, mysterious and more than a little weird. A flood of ideas drenched the stage, aided by a commentator sitting in a box in the corner, chalking up comments onto a large video screen. But there seems, at least to me, on first sight, little coherence to link it all together. Masonic references are played down, but the element of cult is still stressed through colour-coded camps in conflict . . . It may well be that, in 25 years time, I will miss this production. But, in the meantime, it will certainly take me some time to get used to it”. stark staging and dramatic lighting are aided by some very clever technical and production devices, making for a production that I predict will last for another 25 years in the ENO’s repertoire – with the sad proviso, in the present climate, as to whether ENO will be still around in 25 years time. The staging is centred on a huge suspended platform that rises and tilts to create a magical sequence of spaces and effects, no doubt helped by some non-slip shoes for the singers. The sound effects were performed in full view from the side of the stage, whilst a projected chalkboard and background videos were created and projected from the other side, again in full view. For some reason, it all made far more sense than when I first saw it in 2013. As well as tweaks to the staging, there was a new singing cast, bringing some of the finest singing I have heard at the ENO. 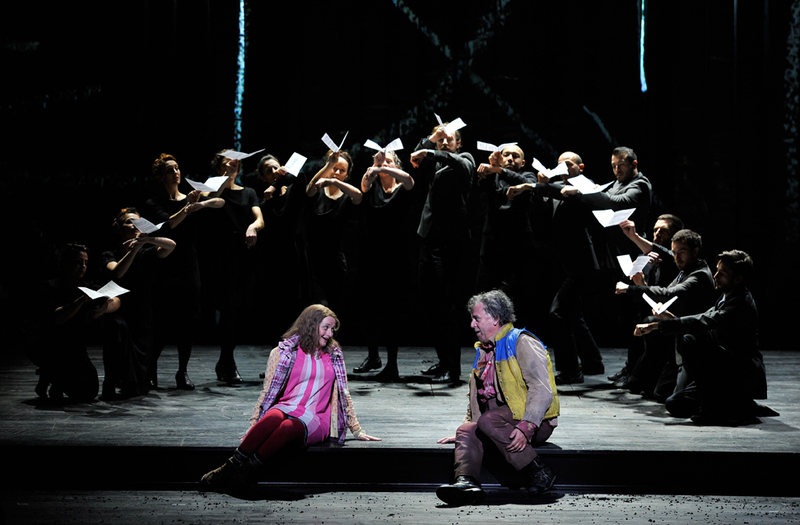 Allan Clayton and Lucy Crowe led the cast as Tamino and Pamina, both outstanding both in acting and singing. They represent an exciting new generation of opera singers both, to some extent, weaned on the early music repertoire. The clarity and projection of their voices, without resorted to the usual operatic vibrato, was an encouraging sign that British operatic singing is beginning to join the 50-year old orchestral early music movement. Peter Coleman-Wright bought an ebullient air of pantomime to his rather aged Papageno, helping to reveal the often concealed comedy in Mozart’s music. As I was accompanied by my daughter, I feel compelled to mention that Soraya Mafi’s sprightly Papagena seemed a little young to be falling for Papageno, however much I might appreciate the attraction the other way round. 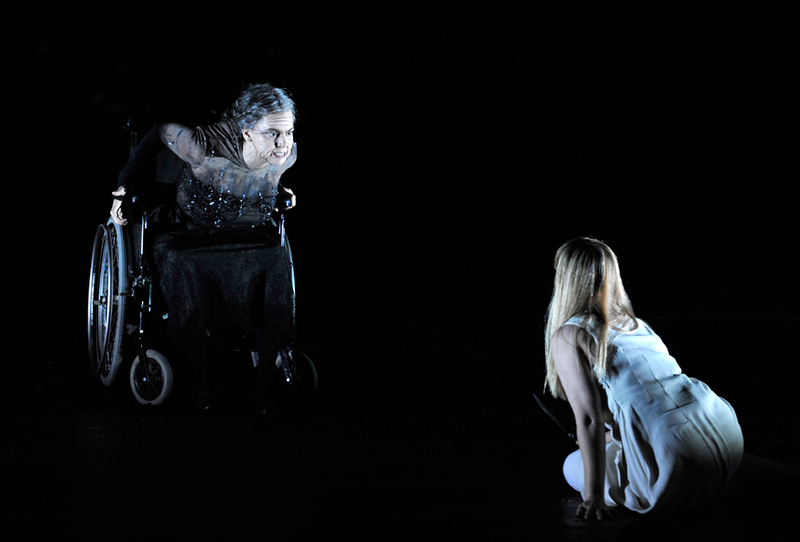 Ambur Braid portrayed a largely wheelchair-bound and rather wizened Queen of the Night, contrasted by some impressively youthful singing, making an effective contrast with James Creswell’s magisterial Sarastro. John Graham-Hall’s disgustingly sleazy Monostatos bought the inevitable boos at the curtain call. All the supporting singers impressed, although the Three Ladies were a little operatic for my tastes. The Three Spirits balanced youthful boys voices with the visual image of little old men. As in the first run, the orchestra is raised to just below stage level, giving an added focus to their sound. They started before the audience had settled, and with the house lights still up – a rather nice touch. Although using on modern instruments, the ENO’s house band is increasingly adept at period performance style. And the conducting of Mark Wigglesworth was excellent, expertly balancing the need for forward propulsion with the need of the singers to have time to sing. There was impressive stage participation from the ENO principal flute player Claire Wickes, who joined Allan Clayton on stage for the flute playing sections. Other players got involved by waving some of the paper birds that accompanied Papageno, and by rising to blow into their violins during the Queen of the Nights, first appearance. Shorn of the usual stage setting, this production pulls the audience into Mozart’s world of magic, mystery, and comedy, leaving sufficient space for individual interpretation of the events depicted and of the individual characters and their relationships with each other. It also teaches me a lesson to make sure to pay more attention to opera revivals. The ENO trailer can bee seen here, albeit with some rather cringe-making vox-pops. A much better verbal overlay can be found here with Mark Wigglesworth’s introduction. It runs until mid-March, and will surely return.